I think it’s safe to say that I saved the best for last. 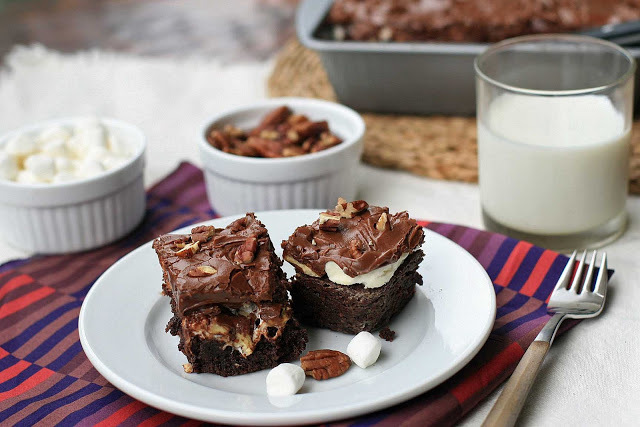 Perhaps it’s just nostalgia… my grandmother used to make a mean Mississippi Mud Cake and this brownie version brings back a lot of good memories of summers at grandma and grandpa’s. Those were the days… wake up, eat breakfast, go to the beach for the day, come home, swim in the lake to rinse the salt from our skin, eat dinner and then play outside until dark. Sleep and repeat again the next day. Not a bad life. While Flavor Ices (Otter Pops for you West Coasters?) or popsicles were our go-to dessert, every once in awhile my grandmother would pull out a showstopper like this and we’d all go crazy (especially after we consumed all that sugar!). I tried to do a couple quality upgrades without straying too far from the original that I know and loved. Instead of a cake made from a mix, rich, fudgy gluten-free brownies serve as the base layer. 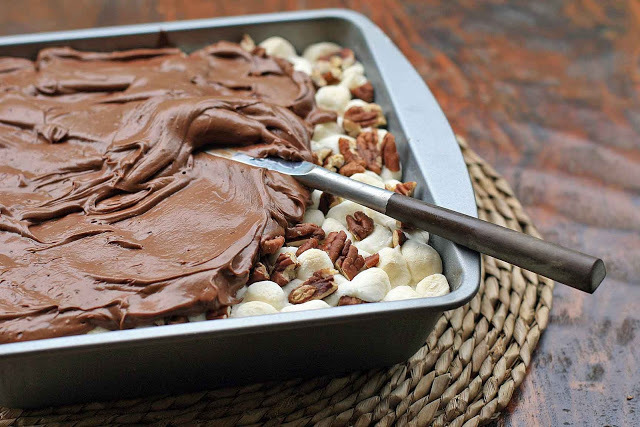 Pecans are toasted for extra flavor and the frosting is a little bit darker and more intense than some other versions. It all adds up to a über rich and very addicting dessert … you’ll want to cut the pieces small and have a tall glass of milk ready. Preheat oven to 325 degrees. Grease a 9-inch square baking pan and dust generously with rice flour. Combine the butter and chocolates in a large bowl and and microwave at 50-percent power for one minute. 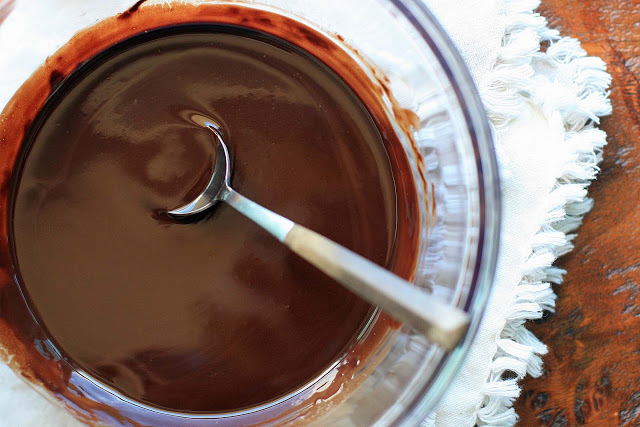 Stir until the chocolate is entirely melted and the chocolate is smooth. If necessary, put the mixture back in the microwave in 20 second intervals. Set aside. Combine the rice flour, sorghum flour, sweet rice flour, salt, baking powder and xanthan gum in a small bowl and set aside. Add the sugar and vanilla to the chocolate mixture and stir to combine. Add the eggs, one at a time, and mix until completely smooth. Add the flour mixture and stir until thoroughly combined. Pour into prepared pan and bake for 30 minutes. 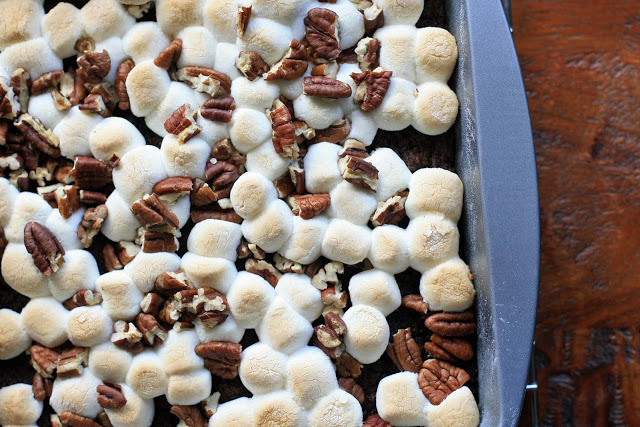 Remove from oven and sprinkle with marshmallows and 1 cup of the chopped pecans. Place back in the oven for an additional 10 minutes. Remove from oven and let cool completely. When the brownies are almost entirely cooled, make the frosting by combining the butter, cocoa, confectioner’s sugar, evaporated milk, vanilla and pinch of salt. Mix until smooth. Carefully spread on top of the marshmallow and pecan layer. Sprinkle with the reserved pecans.